When you’re done vendor-hopping, selfie-taking, and bar-tripping, Penang’s hotels are here to cushion your night. Check out our top hotel picks in this fun northern Malaysian state. Here’s a hotel where even the toilets make you want to stay. Founded by the Sarkies Brothers in 1884, this colonial-style hotel commands top dollar (or ringgit, rather) for its elegant, echo-dome interiors, and extensive view of the Penang Strait. Weddings often take place here. Let it be known that the Peranakans knew what they were doing. 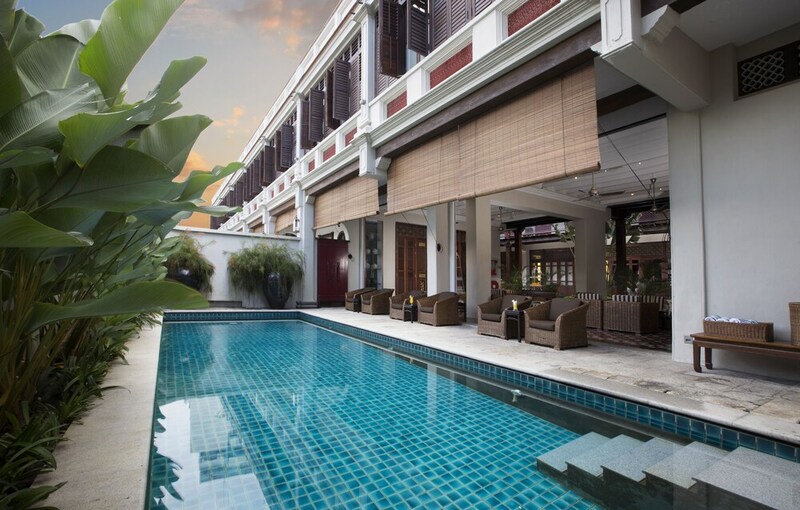 Open courtyards, high ceilings, slatted wooden screens, and Chinese “air wells” are proof of the Peranakan ingenuity in functional architectural design; even in extreme heat, this heritage hotel is refreshingly cool and well-ventilated. Suites are furnished with four-poster beds, blackwood cabinets, and velvet-upholstered furniture. Take a break from the 19th century, and you’ll have this energetic urban space with floating light features and sleek button-backed furniture. The Executive Lounge is where you’ll want to impress your high-flying clients, while the Deluxe Room is perfect for couples and families. Staff are willing to accommodate if you require connecting rooms. Few places in Penang will offer you a library, a rooftop lounge, and a Colonial Room (think high, wooden ceilings and heavyset furniture) for less than 500 MYR (about 130 USD), but Campbell House shares it all, as well as its strategic location at the heart of George Town, for under 480 MYR (about 125 USD). Rooms are furnished with thick drapery, eclectic furniture, and Peranakan tiles (in the bathrooms). The best part about this hotel? The staff is so nice. Got love? Why not stay at the once-infamous LoveLane (totally gentrified now, of course), and hear stories of what used to be? With five different architectural designs inherited from the late 19th and early 20th centuries, your staycation will be as educational as it is fun. Discover Anglo-Indian interiors, 1920’s Tudor revival styles, and cosy duplexes with vintage furniture and contemporary paintings. Located on Gottlieb Road, this apart-hotel features a spacious modern design with optional low lighting and individual cooking units. Fifteen minutes (by car) from George Town, this apart-hotel is perfect for families and out-of-towners who prefer a quieter scene from tourist-ridden attractions. Request a view of the hills, and you’ll get to wake up each morning facing Penang’s dense rainforests. The Botanical Gardens is just a five-minute walk away. This exclusive mansion-hotel has only eight rooms, so book fast! The rooms feature wood-paneled floors and cabinets, louvered window shutters, and — in the case of Room 4 — a wrought-iron spiral staircase leading up to heaven (as in, Room 5). If you’re not staying with your significant other, be sure to check if the bathroom doors are covered — glass may be à la mode, but nobody wants to see his or her best friend’s bits.